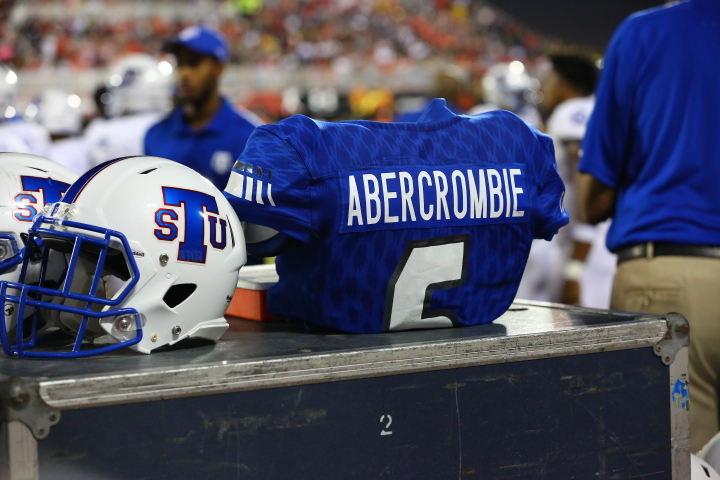 Tennessee State’s Christion Abercrombie is out of the hospital and back at TSU for the first time since his life-threatening head injury. Tennessee State matched up against-crosstown rival Vanderbilt in a game that was supposed to be a money game blow out. It was a good performance by Tennessee State but the game was forgotten as a Tiger was severely injured in the game. Christion Abercrombie collapsed on the sideline during the game and was rushed to the hosptial. He suffered a major head injury that forced him to be in critical condition for weeks. He went into stable condtion and slowly improved over time. Abercrombie is out of the hospital and he returned to campus for the first time since the injury. His mother, Staci Abercrombie, believed that this day would come from the beginning. This woman of great faith is amazed at his progress. Christion Abercrombie’s perseverance and story is most definitely touching. We wish him nothing but the best. Tigers going toe to toe with the SWAC this season. Bill Thomas made his impact in Nashville and Houston.